Christy Matson working on a Jacquard loom. Photo by the author. One of the seemingly mysterious practices associated with curating an exhibition is selecting artists and artworks. Once you have an idea for an exhibition, how do you know who and what to include? How do you know what artists are creating? Even though I’d love to pretend that it’s some innate knowledge that all curators share, this is simply not true. Studio visits are a great way to learn about artists’ practices. Usually when we at the Chipstone Foundation meet an artist, hear about an interesting artist, and/or we see an engaging artwork, we try to request a studio visit. Most artists are very accommodating and happy to show their work to those excited by it. We go view the work and discuss it with the artist, usually making a mental note of everything we see and hear. Thus, when an exhibition idea is taking shape, we have an idea of who would be the best addition to the show. This summer we made the quick trip down to Chicago to visit with Christy Matson. Some of you might remember her from last year’s Milwaukee Art Museum exhibition The New Materiality: Digital Dialogues at the Boundaries of Contemporary Craft (on view March 10–June 12, 2011). Christy is a professor in the Fiber and Material Studies department at the School of the Art Institute of Chicago. She works on both hand operated and industrial Jacquard looms. We were initially introduced to Christy through her textile work Soundw(e)ave.
Christy Matson, Soundw(e)ave, 2004. Jacquard woven cotton, each 34" x 54". Photograph and permissions from Christy Matson. 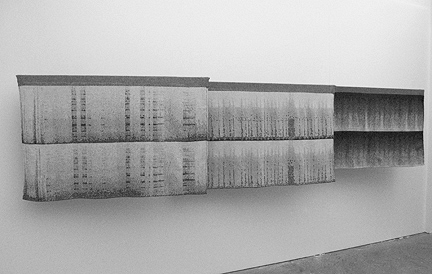 Soundw(e)ave, which was included in The New Materiality, is composed of three spectrograms woven with a Jacquard loom. According to Christy, “Each piece represents the sounds of a different loom while weaving – a handloom, a hand-operated Jacquard loom, and a fully automated industrial Jacquard loom (on which the series was woven).” The piece makes visual how new technologies affect the environment. In this case, the fully automated Jacquard loom is the noisiest of the three. Soundw(e)ave got us thinking about materials, production and the workers in this textile factories. Matson, who is interested in technology and sound, proceeded to create an interactive work in which she wove copper wires into cotton fabric to create sound. The visitor could wave his or her hands in front of the textile and the textile responded with a sound. You can watch a video of how this worked here. Knowing this previous body of work we had no idea what to expect when we arrived at Christy’s studio. We found a room full of looms! 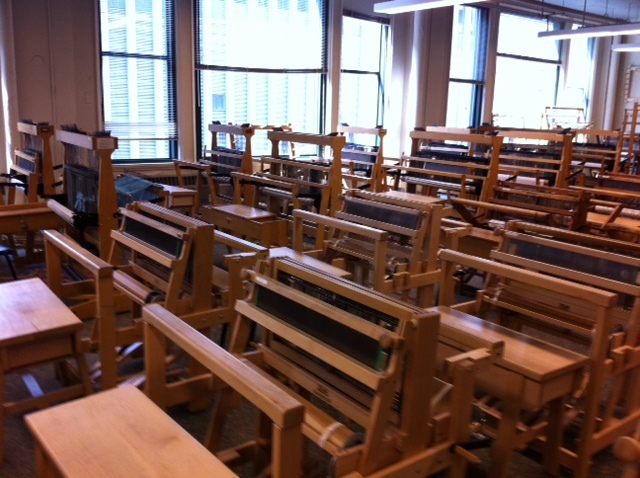 Weaving studio at the School of the Art Institute of Chicago. Photo by the author. She explained that this is where her students work as well. Christy then took us through the process of using a Jaquard loom. This consists of entering certain information (what pattern you want to create, how this translates into warp and weft, etc.) into a computer and then using your hand to guide the thread as the computer controls the loom. It was amazing to watch, especially when you consider all the computations that needed to be worked out before the information was entered into the computer in the first place. Christy’s most currrent work consists of drawn patterns or abstract figures in bright colors, which she then translates onto a woven piece of cloth. She plays with different degrees of translation: her own drawing translating into fabric, and then translating the pattern on the fabric into a different object. How does this change the original design? How do they relate to one another? We left the visit enthralled by the weaving process as well as deep in thought about the significance of this new work, which is so different from the work we knew beforehand. Now you know one way that we learn what artists in our community are making. If you are interested in an artist’s work, ask if you can come over to their studio for a visit! This entry was posted in Art, Curatorial and tagged Chipstone Foundation, Christy Matson, Contemporary Art, textiles. Bookmark the permalink.